Sometimes I just need a little something. A little dessert garnish, a little protein snack, a little candy on a stick, a little caramel drizzle. Here is a little recipe. Three ingredients. But you could use it for many different things. Melt together in a sauce pan over medium heat, stirring constantly with a whisk. When simmering, it will foam up; continue to whisk this down. Then when it starts to boil, it won’t foam quite as much, but keep whisking! You don’t want it to burn. Pour hot into a glass bowl and refrigerate 1hour, serve with dipping apples. Drizzle into homemade ice cream with pecans. Wrap in individual papers (baking paper cut in squares). Make nut power bars: when pulling from heat, mix in 1/2lb each cashews and almonds, and 1 cup raisins (or craisins would be great). 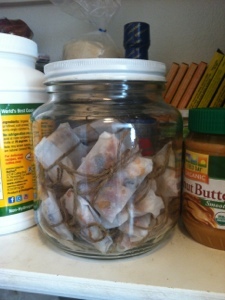 Press into a greased glass baking pan (9×13), cut into squares when cool and wrap in paper with twine ties. Here is a picture of them in a jar in my pantry, waiting to be snacks for Friday School. Toffee bits/pieces for garnish: Spread thin on a large papered baking sheet, top with Himalayan Salt, and freeze 1 hour, then crack. 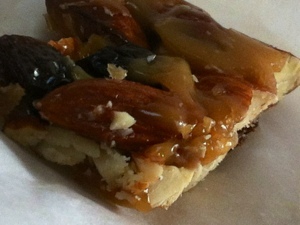 Nuts may be added to the above for nut brittle. Toffeed pecans: cut honey brittle recipe in half to candy coat 1lb of nuts. Separate before cooling or you’ll have a chunk. Cinnamon is a possible addition. 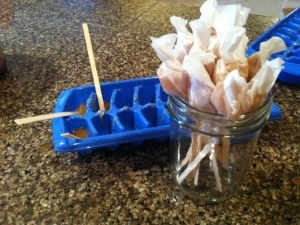 Toffee on a Lolly: pour 1 batch of honey brittle into two sprayed ice cube trays (16 count each, 32 total). Pop a small sized craft stick into each, and allow to cool to warm…pop each out and roll with squares of baking paper. Kids love these! For chocolate flavor, whisk in 1/3 cup cocoa powder after removing from heat.